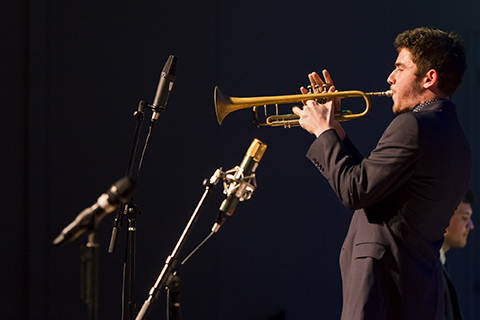 The Frost School’s Studio Music and Jazz Instrumental Program offers you the chance to study with outstanding jazz educators while developing your jazz and studio performance skills and pursuing career goals such as jazz or studio musicians, composers, arrangers, conductors, or instrumentalists. As a jazz major, you’ll prepare for your chosen career by concentrating on tone development, musicianship, and technical mastery of your instrument. Courses stress development of style, improvisation, jazz composition, and arranging. Special sections of jazz theory and ear training are also offered. Approximately three dozen studio music and jazz performing ensembles await you, offering outstanding performance opportunities. Guest artist and faculty/student performances are scheduled for each Jazz Forum, and numerous national and international guest artists perform and lecture on campus each year, enhancing the academic experience. In addition to the multitude of on-campus performance opportunities, the Greater Miami metropolitan area is rich with international, multiethnic sites for work and study. You’ll be pleasantly surprised at how many opportunities exist to gain professional experience in South Florida area jazz clubs, recording studios, Latin bands, cruise ships, theaters, and opera and symphony orchestras. Jazz majors also have access to state-of-the-art facilities in the School’s newly renovated recording studios. The laboratory located in Maurice Gusman Concert Hall integrates computer-based audio/video production systems such as video rendering software, video editing software, audio recording and editing software, and digital synthesis instruments. Equipment includes a pair of Yamaha 02R automated digital mixing consoles, video projector, MIDI synthesizers, networked Apple and PC computers, and surround sound mixing and playback capability. For admissions information, please click here.